Leading Wholesale Trader of plasmatreat plasma systems from New Delhi. 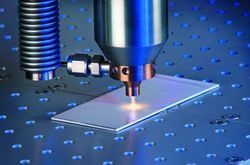 Plasma pretreatment is the key enabler technology for microfine cleaning, surface activation and plasma coating of nearly all kinds of materials – from plastics, metals and glass to cardboard, textiles and composites. More and more conventional industrial pretreatment methods are being replaced by plasma technology in order to make processes more effective and environmentally friendly.Plasma pre­treat­ment is the key en­abler tech­nol­ogy for mi­crofine clean­ing, sur­face ac­ti­va­tion and plasma coat­ing of nearly all kinds of ma­te­ri­als – from plas­tics, met­als and glass to card­board, tex­tiles and com­pos­ites. More and more con­ven­tional in­dus­trial pre­treat­ment meth­ods are be­ing re­placed by plasma tech­nol­ogy in or­der to make processes more ef­fec­tive and en­vi­ron­men­tally friendly.